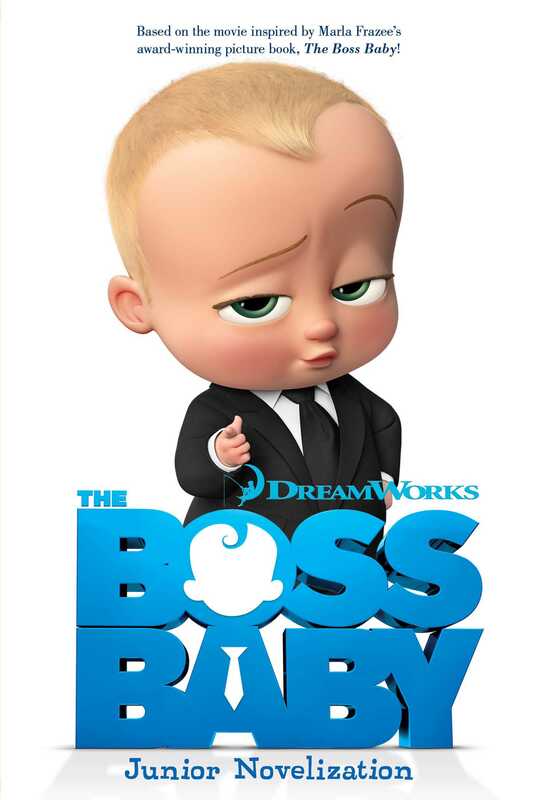 Join everyone’s favorite boss for a hilarious adventure with this take-charge retelling of The Boss Baby! DreamWorks Animation’s The Boss Baby, based on the Simon & Schuster book by Marla Frazee, is now an Oscar-nominated motion picture! From the day the Boss Baby arrived in a taxi, life would never be the same for his older brother, Tim. Sure, the Boss Baby had Tim’s parents wrapped around his chubby, little finger, but Tim knew the truth…this was no ordinary baby. He held meetings! He could talk! And he was on a top-secret mission to stop Puppy Co. from coming out with the cutest puppy of all time and causing Baby Corp to go out of business! But the Boss Baby needs Tim’s help. And if the Boss Baby doesn’t succeed, he’ll be fired from Baby Corp and these two rival siblings will be forced to be brothers forever. Can Tim make a deal with the Boss Baby, stop Puppy Co., and get the Boss Baby out of his life for good? (And will the Boss Baby finally get the corner office with the private potty he deserves?) Find out in this retelling of the new movie! The Boss Baby © 2017 DreamWorks Animation LLC. All Rights Reserved. My name is Tim, and this is my story. It starts when I was seven years old, and I relied on my imagination. Back then life was one big adventure after another. At least, that’s how I remember it. It was just the three of us—the Templetons. Me, Mom, and Dad. And Mom and Dad had lots of time to play with me. I had the greatest parents ever—and they had the coolest jobs! They worked for the biggest pet company in the world: Puppy Co. They got to test out all the new products for puppies. Sometimes, they let me help. But even though they were busy, they always had time for our adventures. Bath time was never just bath time—we would pretend we were swimming with sharks under the ocean! And every night, we had our special bedtime ritual. Three stories. Five hugs. And finally, Mom and Dad would sing my special song. When they finished singing, they would tuck me in and I would drift off to sleep, perfectly content. I was the star of the Templeton family show. The center of the universe. Maybe I should have wondered why he asked me, but I didn’t. Instead, as I drifted off to sleep, I wondered where babies came from. Long conveyor belts carried new babies around a big baby factory. The babies got diapers and booties. Then a machine arm tickled their tummies. The babies who giggled got sent down a chute with a blinking green sign that read: FAMILY. I saw lots of babies giggle, one after the other. Then one baby got tickled, but he didn’t giggle at all! The sign turned red, and read: MANAGEMENT. A flipper knocked the baby down a long, steep chute. His booties and pacifier flew off. He dropped down the chute into a pair of black pants. Then machine hands gave him a pair of loafers, a watch, and a jacket and tie! A robotic suction-cup picked him up and dropped him into an office chair. The chair rolled down a long tube. A machine arm handed him a briefcase, and another arm handed him a bottle with a label that read: SUPER SECRET BABY FORMULA. Then the office chair rolled into a room filled with cubicles, like in Mom and Dad’s office. The baby in the suit slid behind the desk. Somehow, I knew what this strange baby was. He was a Boss Baby. When I woke up, I remembered the whole dream. I thought it was weird and then forgot about it, until a few weeks later. That’s when everything changed, and my weird dream became a real-live nightmare!